Having received (in less than 2 weeks in fact) my devkit ordered from ebay, I was able to carry on my investigations. As noted before, the devkit comes with a USB connection and power regulator. Same principle as on the Arduino boards. The version bought is the newest devkit 1.0 (AKA v2 on Seeedstudio). > Please run file.remove("user.lua") before first use. Please run file.remove("user.lua") before first use. Time to try with a different/more recent firmware. As we say in french "Never Two Without Three". So after the HM-12 and the ESP-201, something was bound to go awry! Using the latest version of esptool, I uploaded a new firmware... flashing was reported as successful but the module couldn't even boot! And this was the case with all firmware I tried. I.e. using DIO for flash_mode (instead of QIO) and 32Mb for flash_size (instead of 2Mb). Then, at least I could boot! But the filesystem (used by LUA) was destroyed and the list of files was returning strange data. That said, it is still impossible to open any file from LUA. There are a few comments about this problem on the Seeedstudio page, so I am not alone. 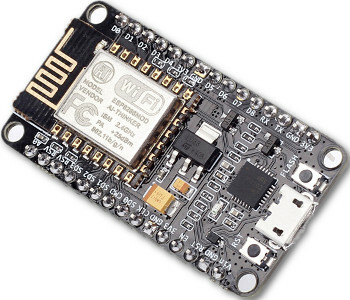 I actually wonder if the nodemcu builds are truly compatible with this new hardware! Many thanks to Johny Mattsson for his workaround to this issue and for taking the time to notify me. I am happy to report that the new esptool.py (on dev branch) now unlocks the filesystem. See pull-request note Workaround write-protected flash when using esptool.py to flash in DIO mode for more information. I happened to have a spare (old) wifi router. And with this new set-up, TCP connections were fine either as a client or as a server!!!! How annoying (and unpractical as I don't really want to multiply routers). And also what a waste of time and energy. Since all types of firmwares (AT, nodemcu, arduino's) are plagued by this problem, it might be link to the Espressif's SDK I presume. But I still can't pinpoint what exactly is happening and why some IPs are reachable while others are not. At least, I could play with my two modules. Like this blogger, who seems to have quite a lot of experience on ESP8266 modules, I am now convinced that Arduino's ecosystem is the way to go, at least for now.